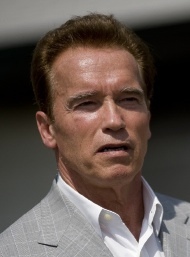 NYTimes Green Inc has a post on Gov Schwarzenegger’s position on renewable energy. One of the most notable elements of Gov. Arnold Schwarzenegger’s executive order on Tuesday increasing California’s renewable energy requirements was his blunt stand against protectionism. Clean energy imported from other states was welcome, the governor said, to keep down electricity prices. You have to understand that we get our water from outside California. We get it from the Colorado River, for instance. Why can we get the water from the Colorado River but we can’t get renewable energy from outside the state? We get most of our cars from outside the state; why can’t we get renewable energy? This is probably a smart move as the California environmental groups fight renewable energy projects. A proposed solar-energy project in the California desert that caused intense friction between environmentalists and the developers of renewable energy has been shelved. BrightSource Energy had planned a 5,130-acre solar power farm in a remote part of the Mojave Desert, on land previously intended for conservation. The company, based in Oakland, Calif., on Thursday said it was instead seeking an alternative site for the project. Seattletimes.com writes that California’s renewable energy targets will drive up energy prices in Washington state. California may come hunting soon for large amounts of wind power from the Pacific Northwest, and that has many Washington utilities worried about increased competition and higher electric bills for consumers. Gov. Arnold Schwarzenegger signed an executive order last week requiring California to get 33 percent of its energy from green sources such as wind, solar and geothermal by 2020. That's up from an earlier 20 percent mandate. Given California's population of about 38 million people, the move is expected to create a major shift in the world of renewable energy. "This is really going to be felt from the tip of northern British Columbia down to Mexico and all across the West," said Steve Ernst, editor of the Northwest energy-policy newsletter Clearing Up. One government estimate says California would need an additional 5,700 average megawatts of renewable energy — enough to power more than 3.7 million homes. Washington utilities, by comparison, are projected to need an additional 1,000 average megawatts of renewable energy by 2020 to meet their own requirements mandated by Initiative 937. An average megawatt is 1 megawatt of electricity delivered continuously for one year. Some Northwest utilities are particularly concerned about something the industry calls "unbundled renewable energy credits." Basically, California power companies could purchase green-energy credits from Northwest wind farms, but not pay to transmit the electricity to California. In other words, they'd leave the electricity here but still get credit for the green energy. It is not going to be easy to calculate your carbon footprint in a California based data center. Do you assume in 2020 33% of your energy is carbon free?